Featured amenities include luggage storage and coffee/tea in a common area. A roundtrip airport shuttle is provided for a surcharge (available 24 hours). Make yourself at home in one of the 12 air-conditioned rooms featuring minibars and flat-screen televisions. Complimentary wireless Internet access keeps you connected, and satellite programming is available for your entertainment. Private bathrooms with showers feature complimentary toiletries and hair dryers. Conveniences include phones, as well as laptop-compatible safes and desks. With a stay at Sultanahmet Guest House in Istanbul (Fatih), you'll be minutes from Hippodrome and Blue Mosque. This hotel is close to Basilica Cistern and Hagia Sophia.Rooms Make yourself at home in one of the 4 air-conditioned guestrooms.Amenities Make use of convenient amenities, which include complimentary wireless Internet access and concierge services.Dining Buffet breakfasts are available daily for a fee.Business, Other Amenities Featured amenities include complimentary high-speed (wired) Internet access and a 24-hour front desk. Make yourself at home in one of the 55 air-conditioned rooms featuring minibars and LED televisions. Your pillowtop bed comes with down comforters and Egyptian cotton sheets, and all rooms are furnished with sofa beds. Rooms have private balconies. Complimentary wireless Internet access keeps you connected, and satellite programming is available for your entertainment. Private bathrooms with showers feature complimentary toiletries and hair dryers. Make yourself at home in one of the 7 air-conditioned rooms featuring refrigerators and LCD televisions. Complimentary wireless Internet access keeps you connected, and satellite programming is available for your entertainment. Bathrooms have showers and hair dryers. Conveniences include desks and electric kettles, and housekeeping is provided on a limited basis. Located in Istanbul (Sultanahmet), Sultanahmet Deluxe Hotel is within a 15-minute walk of Sultanahmet Square and Blue Mosque. 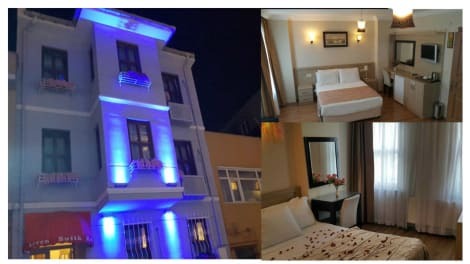 This hotel is 0.6 mi (1 km) from Hagia Sophia and 0.6 mi (1 km) from Grand Bazaar. Take advantage of the hotel's room service (during limited hours). Mingle with other guests at the complimentary reception, held daily.